A phenomenally talented writer with a strong sense of logic and history, Tom Bissell has often explored war and its moral complexities in his writing, including as a reporter in Iraq and Afghanistan. In the last few years he has also become the veteran of "eight- or nine-hundred digital wars." 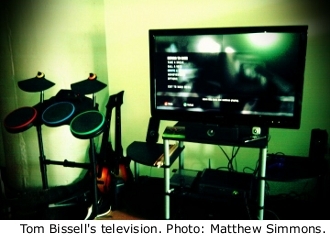 As he confessed in a recent excerpt from his book Extra Lives in the UK Observer, Bissell spent three years high on cocaine and playing video games while his formerly prolific writing ground to a halt. Videogames have recently become not only his obsession but his subject. Along with his recent book he has become The New Republic‘s resident video game critic, a first for the magazine. Following the firestorm surrounding Roger Ebert’s comments about why video games are not art, Bissell and Simmons hazard the opposite opinion and discuss the conflict between interactivity and narrative, as well as their possibilities. Matthew Simmons is the author of the short story collection A Jello Horse and a recurring contributor to the Believer. Here he limns that eternal question: Is humanity regressing or did I just move back to my hometown? 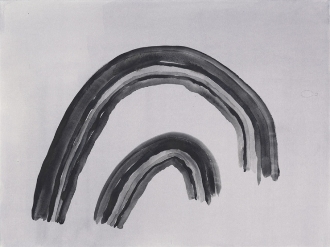 Accompanying images of "Graybows" are from artist Joe Hardesty.